If you follow me on Instagram you have most likely stumbled upon a bowl that looks similar to this one, only a tad less "food styled." 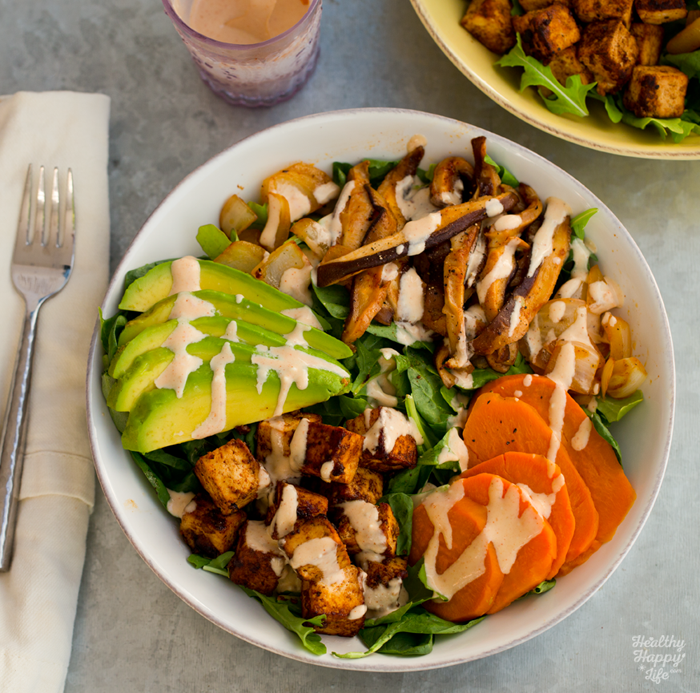 Because in real life, my avocados are not done in a perfect fan and each cube of tofu placed just so, so that the crispy blackened edges blend perfectly into the fluffy green salad background. Because in real life, looks count, but flavor trumps all. 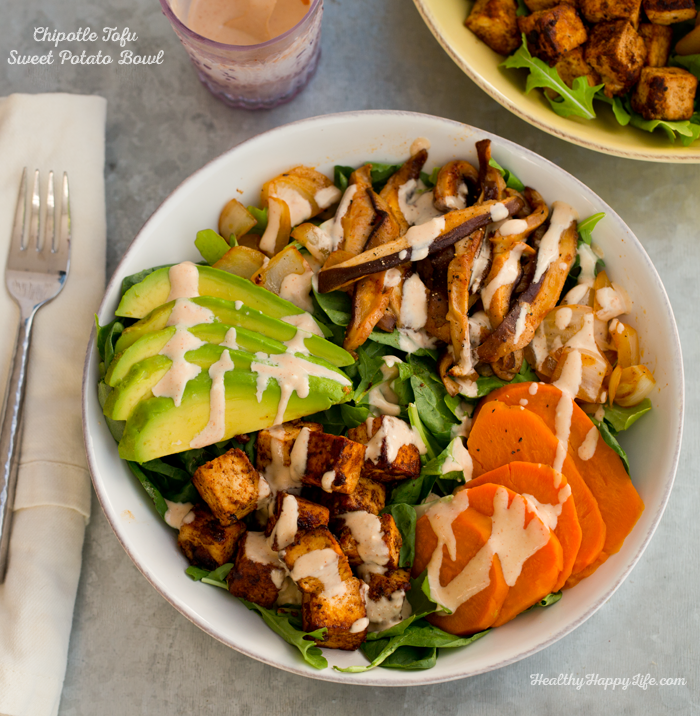 My Chipotle-Maple Sweet Potato Tofu Bowl is one of my favorite go-to dinners to make for my husband and I. So I am happy to share it with you on my blog, and not just Instagram! I hope it becomes a go-to fave in your household too..
A spin on this bowl on Instagram.. Typical for our meals. Quick side note to LA-based kitty lovers. There is a super kitty charity event by FixNation called Whiskers in the Moonlight later this month. check it out here! Change Up The Protein. 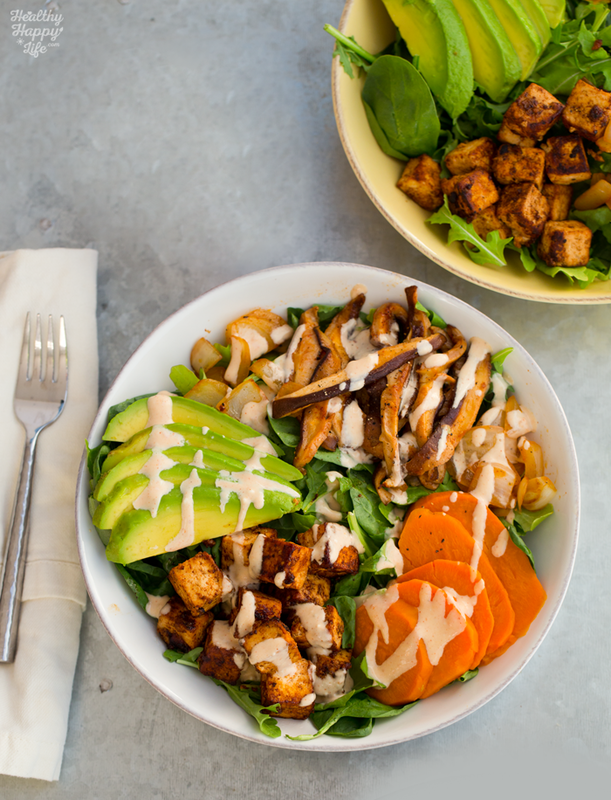 You can easily swap out to tofu for tempeh, chickpeas, lentils or even something like Beyond Meat vegan Chick'n. Change Up The Greens. The leafy green base can be anything you want it to be! Kale, spinach, arugula, machê, chard and more. Just make sure you greens are organic - that really makes a big difference with delicate plants like leafy greens. 1. Adds Flavors You Love! 2. Adds Diversity in Color! 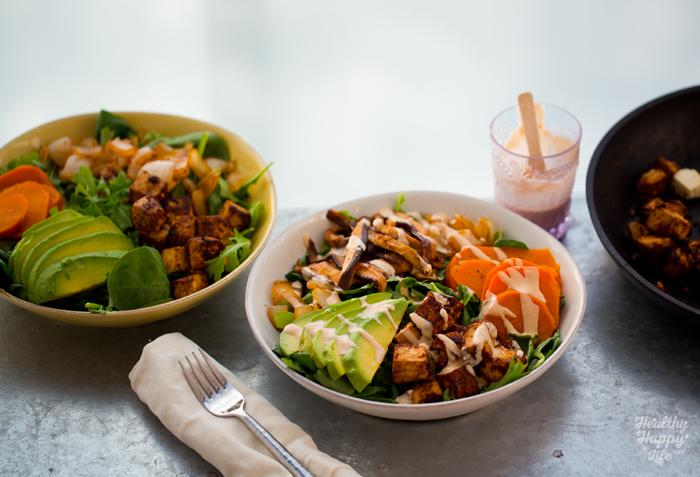 The key to the healthy properties of this bowl are in the diversity of the plant flavors and nutritional properties. Eating the rainbow is not just a cliché, it really is a smart way to eat for health since all those colors have various antioxidant characteristics. ...And when I say diversity in color, healthy whole foods with bland colors like walnuts, brown rice, lentils and mushrooms of course count too! I am always looking for fun new ingredients to add to this bowl so please inspire ME. 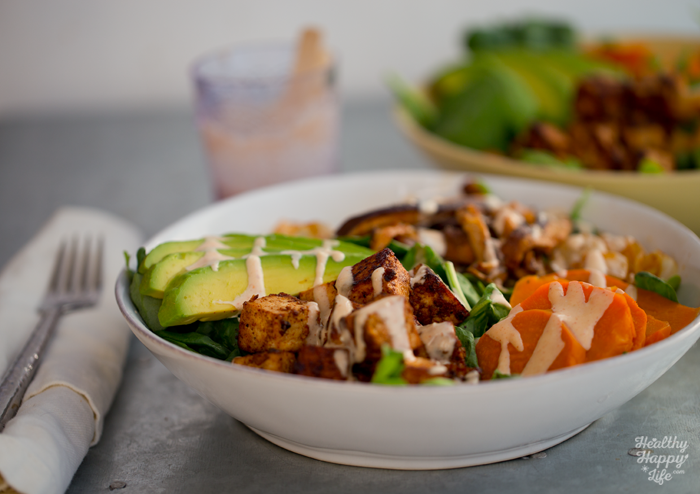 Leave a comment telling me what new ingredient you will add to this bowl when you try it! 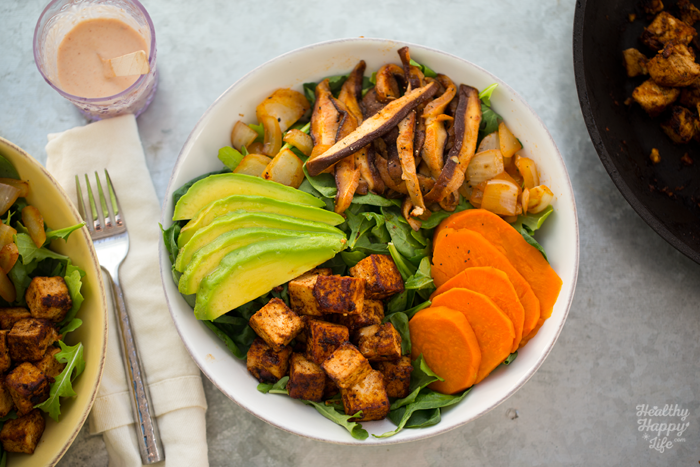 This go-to dinner bowl contains leafy greens, tofu, sweet potato, avocado and more. Sweet Potato, using a large pot of water over high heat, boil sweet potato until tender, this usually takes about ten minutes on your stovetop. Drain and set potato aside. Heat a large saute pan over high heat and add 1 teaspoon extra virgin olive oil. Add in the onions and shiitake mushrooms. Add a drizzle of tamari (about 1 tsp) and a sprinkle of black pepper. Saute until the onions caramelize and the shiitake mushrooms are tender and edges start to brown a bit. Transfer this mixture to a side bowl. Tofu: Heat the same large skillet over high heat. Add one teaspoon of the extra virgin olive oil. When oil is hot, add the tofu cubes. Saute for 2-3 minutes until edges start to brown. Then add in a 2 teaspoons of tamari and 2-3 teaspoons of maple syrup, along with generous sprinkle of the spices: paprika, cumin and chipotle powder. Salt and pepper to taste. Optional: a sprinkle of nutritional yeast. Saute and flip tofu cubes until all the sides are blackened and you are happy with the flavor. 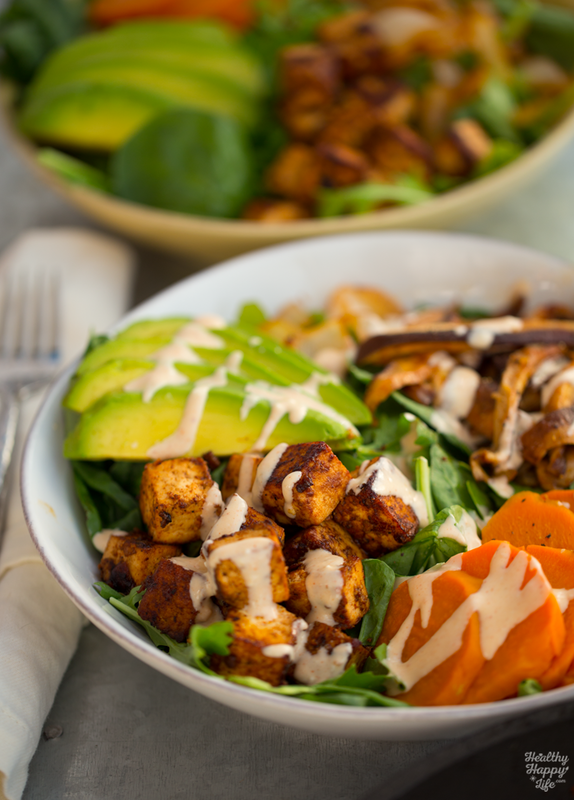 Note: Another option is to add minimal spices and drench the tofu in a homemade or bottled vegan BBQ sauce! Also delicious. 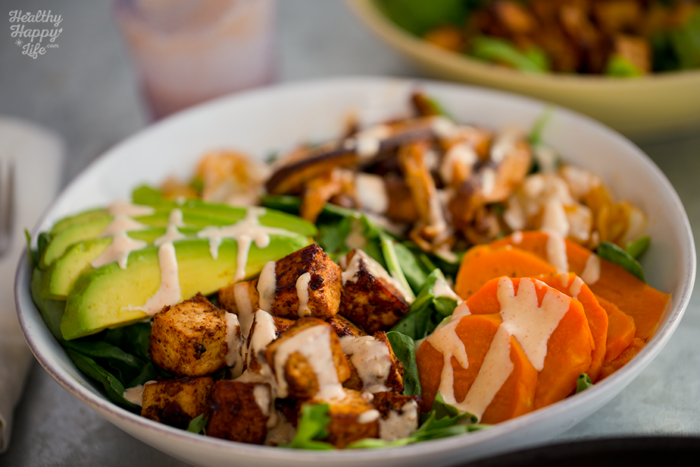 Sauce: Whisk the vegan mayo, hot sauce, maple and paprika together until smooth and creamy. Place in fridge until needed. Ready to assemble! Add two cups of greens to each serving bowl. Then add the sliced avocado and slices of cooked sweet potato. Then add the onions and mushrooms. And finally, add those sizzling hot tofu cubes. Drizzle the creamy sauce on top and serve! Optional: add nutritional yeast and lemon sprinkle over top!